While most mobile fitness apps are focused on wrist-friendly wearables, Apple could be planning to tap into the smartphone that is already in your pocket to record footsteps and other data. 9to5Mac has done some digging into Apple's latest iOS 8 beta 3, released July 7, and found it includes several improvements to the built-in Health app that made its debut during WWDC 2014. Starting with the latest beta, the Health app now appears to tap directly into the M7 motion tracking hardware included in the iPhone 5S to source fitness data. There's no need for the fabled iWatch or other fitness devices worn by the user. Using nothing but the handset, the Health app is now capable of reporting the user's motion in a Steps counter tab. The tab includes a full week's worth of data that can be sorted by Day, Week, Month or Year, similar to other health-centric apps. According to the report, the Health app works quite well using nothing more than the new on-device support, adding that tracking works for both steps and distance. In addition to tapping into the M7 sensor, Apple's Health app has also added caffeine intake to a long list of nutritional categories the software can track, a welcome addition for frequent java or tea junkies. Last but certainly not least, the Medical ID section of Health has been tweaked with a red navigation bar that makes the emergency card feature of the app a bit easier on the eyes. 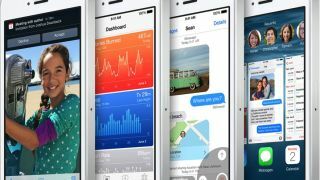 iOS 8 beta 3 was released to developers along with a third release of OS X Yosemite 10.10 for the Mac, which delivers iCloud Drive signup, Wi-Fi calling for T-Mobile iPhones and improvements to QuickType, Photos and FaceTime. Hot or not? Dive into our Microsoft Surface Pro 3 review and find out!